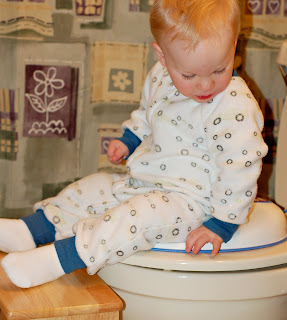 Yesterday I decided to introduce Zack to the potty seat. He said he had to go potty, so I put the small seat on the toilet, took off his diaper, pulled up the step stool and he was king of the thrown. He sat there for at least ten minutes just playing with the toilet paper and trying to touch the water, but not producing any results. I made him get down and he was very upset with me. When it was time to brush his teeth, he immediately ran into the bathroom and jumped up on his thrown. Tonight he wanted to potty again, so before his bath I sat him on the seat and he actually pottied!!! I couldn't believe it. My son, who has fought me at every diaper change and loves having dirty diapers is actually getting the concept of the toilet. I thought he'd be a late trainer, but maybe his dislike for diaper changes will actually push him into underpants. I'm sure we have a long road and I am probably creating a monster starting this soon, but maybe this will work. Here is a picture of my big boy from last night after getting his teeth brushed.